Interra is an international tomato wholesale distributor that offers the finest regional tomato products at wholesale and bulk prices. We source out tomato products and ingredients from top producers across the globe. Our tomato product suppliers guarantee excellent manufacturing practices and quality products in strategic locations around the world such as Europe, United States, and South America. Our specific value to your organization comes from our expertise in logistics combined with our excellent relationship with the best partners and bulk suppliers. These important supply chain essentials will ensure you the best quality and price value for your company’s tomato product needs. 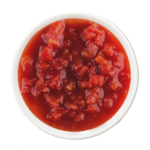 Wholesale tomato paste is an essential ingredient in many food product and restaurant offerings. 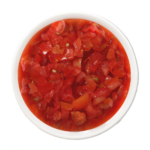 Rich tomato flavor is key to stimulating the taste buds and accentuating the savory notes of your product. Bring to life your tomato-based recipes with quality tomato paste. 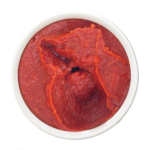 As a tomato paste distributor, our bulk tomato paste is manufactured from red ripe fruit that conforms to the provisions of the Federal Food, Drug, and Cosmetics Act in every way. Processing is in accordance with established company policy and FDA Good Manufacturing Practices. Finished product shall meet the standards set by the FDA, the USDA and the California Department of Food and Agriculture. All tomato paste is allergen and GMO free. Organic tomato paste and kosher tomato products are available. Plastic Drum Weight 561 ± 5 lbs. 532± 5 lbs. Wood Bin Weight 3155 ± 10 lbs. 2905 ± 10 lbs. Plastic Drum Weight 564 ± 5 lbs. 535± 5 lbs. Wood Bin Weight 3190 ± 10 lbs. 2940 ± 10 lbs. Source your concentrated crushed tomatoes from a premier supplier of canned tomato products. Vine-ripened tomatoes that are cooked, crushed, and canned to provide a thick consistency will enhance any recipe. Our suppliers use the best ripe red fruit that conforms to the provisions of the Federal Food, Drug, and Cosmetics Act in every way. Processing is in accordance with established company policy and FDA Good Manufacturing Practices. Finished product shall meet the standards set by the FDA, the USDA, and the California Department of Food and Agriculture. Our tomato products are allergen and GMO free and available organic and kosher. Plastic Drum Weight 557 ± 5 lbs. 528± 5 lbs. Wood Bin Weight 3105 ± 10 lbs. 2855 ± 10 lbs. Are you looking for bulk diced tomatoes that have great texture and nice balanced flavors? Interra International sources its tomato products from quality tomato suppliers around the world. We choose our partners based on quality and strategic location to best serve you. Our diced tomato producers are processed from mature, whole red tomatoes that have been peeled and diced. They conform in every respect to the provisions of the Federal Food, Drug and Cosmetic Act. The ranges listed below are typical: products made to customer specification may include values not listed. Our tomato products contain no allergens and no material from genetically modified organisms. 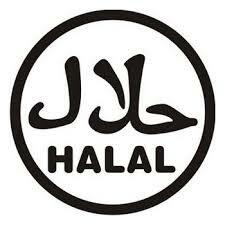 We also offer organic and kosher products. 55 Gallon Drum: 475 lbs. +/- 5 lbs. Ingredients: Tomatoes, tomato juice, and citric acid. Interra International is a global supplier of wholesale tomato products. We provide our new and existing customers with a wide array of quality tomato products (including organic and kosher varieties) and have dedicated staff to support your unique foodservice business. Our supply chain management and carefully selected bulk tomato sources help you get the best price and products for your business. Whether your business is traditional or multicultural, our highly trained staff is here to support you. To learn more or to get in touch with our wholesale tomato specialists, please call us or use our contact us form and we’ll be happy to assist you. Typical Specifications: The majority of tomato products are manufactured and sold to individual specifications.As an agricultural product, natural variation can occur. Most products are manufactured and sold to individual specifications. Packaging: All product is aseptically packaged in 300 gallons or 55 gallons’ sterile bag. Flavor and Aroma: Typical tomato flavor, free from scorched, bitter green tomato, or other “off” flavors or odors. Labeling: All tomato paste or concentrated crush tomatoes produced is labeled with the container number, open lot code, type of product, gross and net weights and the Kosher Certification. Other specific labels can be attached at the request of the customer. Kosher Certification: Product is manufactured under the supervision Kashruth Division of the Orthodox Union and is certified Kosher when bearing the Orthodox Union symbol. Product shelf life is a minimum of 2 years (24 months) stored @ ambient temperature. Do not allow to freeze.